It's good to be young. I remember that. I'm not young anymore, and frankly wouldn't be young again for all the money there is. But that's age's privilege, to celebrate itself. Every age's privilege, in fact, and Samantha Irby celebrates being young. In a very testy way. This is the kind of problem a lot of folks of either gender and all persuasions would enjoy having, if the dating sites' usage and match-up numbers aren't complete lies. Irby's brand of testy humor gets a laugh-out-loud funny workout in her meditation on the American obsession with weight, weight loss, effort-free weight loss, and laziness in "The Tapeworm Diet." She appears, on her teensy little blog avatar, not to be an immensely large person, but I don't know this for a fact as I've never met the lady. She claims to be sizable: "I eat bad things and go to sleep immediately afterward. There, I solved the mystery of fatness for you. You're welcome." Garshk, and here I thought it was my slow metabolism! A typical day in the life of Kansas State University nutrition researcher Mark Haub, creator of the Junk Food Diet, which consists of 60% junk food supplemented by a protein shake, multivitamin pills, and a can of green beans or four stalks of celery every day. He avoided meats, whole grains, and fruits. September 10, 2010: A double espresso; two servings of Hostess Twinkies Golden Sponge Cake; one Centrum Advanced Formula pill; one serving of Little Debbie Star Crunch cookies (my jam! ); a Diet Mountain Dew (barf); half a serving of Doritos Cool Ranch corn chips; two servings of Kellogg's Corn Pops cereal; a serving of whole milk (squirt! ); half a serving of raw baby carrots; one and a half servings of Duncan Hines Family Style Chewy Fudge brownie; half a serving of Little Debbie Zebra Cake; one serving of Muscle Milk Protein Shake drink; Total: 1589 calories. Sing it, soul-daughter. Couldn't have said it better myownself. The spoiledness of the average American is never in more breathtaking relief than in diet advice and weight-loss program information. Most people on the planet would like to have enough food to get full once a day. People here eat so much they need advice on how not to turn into land-blimps. Something is wrong with this picture. 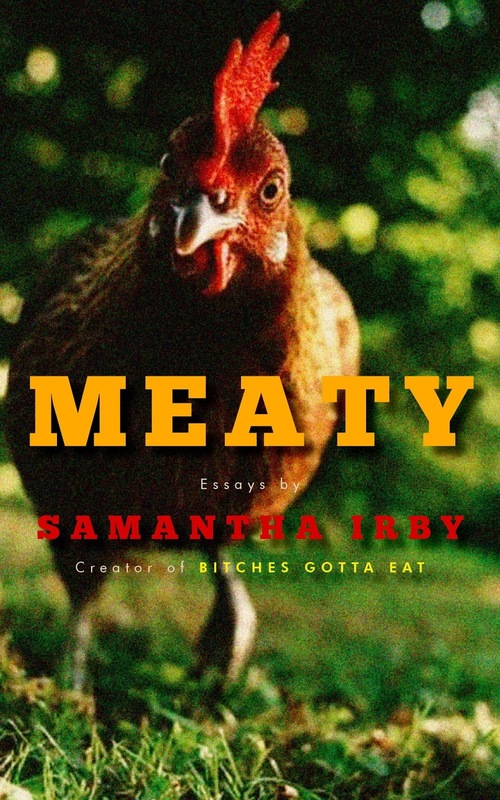 Samantha Irby makes you giggle as she pokes your social conscience, so permaybehaps people who need to hear will listen without realizing what they're hearing. It's the only way past their privileged-person defenses, the evidence shows. The collection is far and away best taken in doses. It's like any smorgasbord. The offerings are tempting, and the urge to overindulge is strong. Resist the urge that you not grow indifferent to the charms of the groaning board! Read one or two of these tempting treats. Put the book down, pick up something grim and joyless for a contrast...are you caught up on your Bolaño reading? isn't there a new Murakami or something?...and then come back to laugh and learn.